This review first appeared in the October 25, 1996 issue of the North County Times. Whoa  what is this? Who is this? That's gotta be a common reaction to anyone hearing this album for the first time. 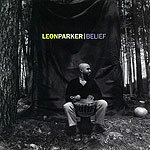 "Who" is Leon Parker, drummer. "What" is a whirling, swirling, percussion-based jazz with strains of Tony Williams and Paulinho da Costa, Buddy Rich and Mongo Santamaria. The result is that this is one of those albums that kinda gets stuck in the stereo, an album that forces you to finally figure out how to use the "repeat" feature on your CD player. It's much more than just a showcase for Parker's considerable drumming skills; it's a complete package of oustanding compositions and great horn playing on top of his always intriguing, swinging backbeat.